I find it very exciting to watch flower buds develop and emerge through the foliage in the garden. Such is definitely the case with coneflowers (Echinacea). I am drawn to coneflowers with dark stems, such as Echinacea ‘Solar Flare’ photographed earlier this week growing in the east part of the Entry Garden Walk (by the straw bale shed). 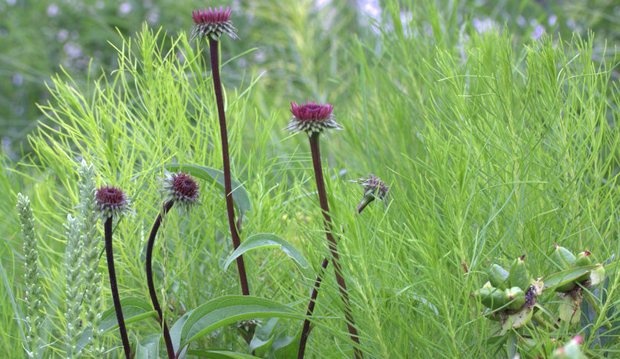 The dark stems dramatically stand out against the fine foliage of the threadleaf bluestar (Amsonia hubrichtii), the ripening seed pods of the peony (Paeonia) and the spikes of blazing star (Liatris) shooting up and soon to also add their touch of colour to the mixed planting. I recall learning that the origin of the genus name Echinacea comes from the Greek word “echino” which translates to hedgehog. One can understand the rationale of early botanists if one takes a moment to have a really close look at one of the emerging buds. 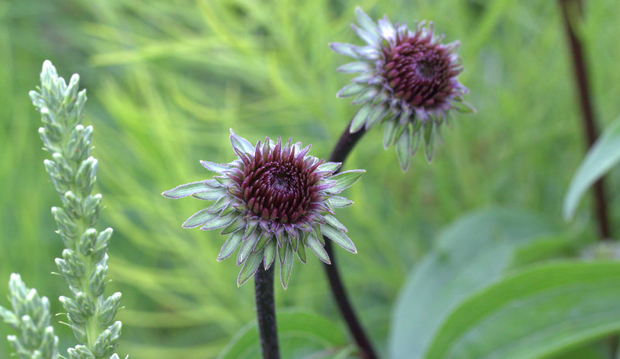 In recent years there have been many, many developments and Echinacea introductions. Fragrance, incredibly vibrant colours and intriguing flower shapes have been all the rage. This year four new cultivars from Terra Nova are being trialed on the north side of the President’s Choice Show Garden. These include E. ‘Colorburst Orange’, ‘Glowing Dream’, ‘Meteor Red’ and ‘Secret Glow’. We will be closely watching these and other introductions from the past few years to evaluate their performance in the garden. Many of the new colours are truly intense. I will be watching closely to see if many of these new intros also have the added interest of dark stems and flower buds. Despite all the new intro’s, I continue to have a soft spot for many of the coneflower species. 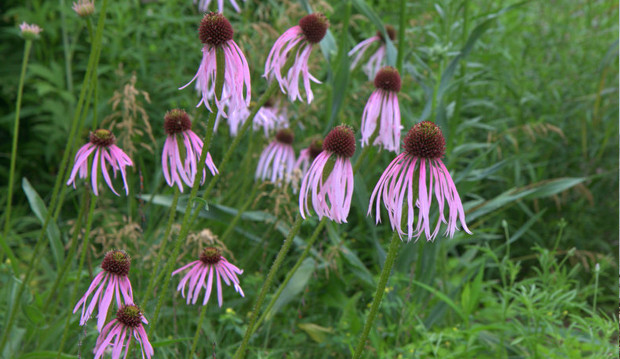 In particular, I have been a long time admirer (and grower) of Echinacea pallida, commonly known as the pale purple coneflower. Tolerant of heavy clay soils, once established this species is also very drought resistant (although that is not a concern this season). The simple blossoms are often described as “stringy in appearance” and are an excellent way to attract butterflies, bees and even song birds to a city garden. For those who face the challenge of deer visiting their garden, considering planting E. pallida, as it appears not to be a choice menu item for these feeding machines. Other dark stemmed and notable Echinacea cultivars to consider include ‘Vintage Wine’, ‘Merlot’ and ‘Fatal Attraction’. Regardless of which Echinacea you prefer to grow in your garden, I recommend leaving some of the seed heads to persist through the winter. They will add their own special touch of drama, colour and winter interest. Personally, this is the inspiration of the first Mohawk. The birds will also thank you for the winter snack. Currently pallida is bloom both in the Nature’s Garden and in the meadow area of the Woodland Walk and Bird Habitat. A reminder, when visiting these gardens, tread quietly so as not to startle the many American goldfinches and other feathered friends who are also enjoying the gardens. Paul Zammit is the Nancy Eaton Director of Horticulture at the Toronto Botanical Garden. A graduate of the University of Guelph, Paul was formerly employed at Plant World, a large retail garden centre where he was the perennial department manager. He is a regular speaker at garden clubs and horticultural trade shows across Canada and in the United States. He has appeared both on television and in print. What’s in Bloom: I didn’t know you could grow that here?! Paul’s Plant Pick: Does it Flower all Season Long? It’s show time! And Helleborus niger ‘Maximus’ ready for its close-up. Paul’s Plant Pick: A Feeding Frenzy! Paul’s Plant Pick: A surprise of beautiful foliage even in winter! Paul’s Plant Pick: Imagine! Blossoms on December 14th! Paul’s Plant Picks: Could it be?